Fun stuff. 🙂 What other web services would be fun to add as “Send To” custom links in Google Reader? I subscribed to Fubiz, a French design blog, clicked the “Feed settings…” dropdown, then “Translate into my language.” Also works on the folder level if you have an entire folder of disparate languages. Oh. Ahem, and more on topic, I imagine this would be handy to send yourself blog posts to, say, a WordPress installation, using the post text as a base to begin writing from about the topic. 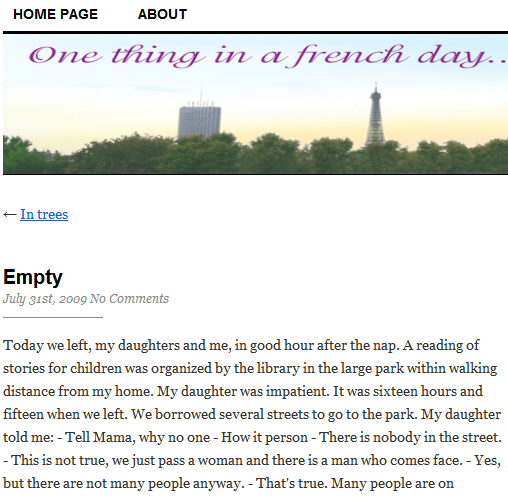 Though, I suppose you could use StumbleUpon or similar service as a reminder to post. One handy use of sending to Twitter with shortened URLs would be to subscribe to your own blog, and use “Send To” to easily tweet about posts. Is there a way to update Twitter with a custom link so you could insert text into the tweet (ie, “New post on my blog: [url]”)? I haven’t looked at the Twitter API, so don’t know. But why not just use the translate option inside of Reader?? The second one nails the favicon, too, and has some troubleshooting advice. But there is already a translate function. Under “Feed Settings” you can see the feature “Translate into my language”. That’ll come in real handy once I’m actually able to *use* the Send To feature, which it appears hasn’t been fully rolled out. Ahhhh, now I see, I have to fiddle with the options just to see the new feature. a very useful feature, nice! Nice tips Matt, I thought its impossible to send translated post. Any idea how to attached flash? Good tip Matt, but you should explain that “Send To” is not enabled by default unless you go into the preferences and select at least one “send to” site. This looks appealing but it’s unlikely I go through the small hoop unless I hear about a phenomenal blog in another language. I realize I’m being greedy here, but would it be easy for Google Reader to remember my default language and do this automatically unless I specifically tell it not to? Mark Essel, I recommend that you read Carter Cole’s excellent remark. This Autotranslate option will come in handy when I only want to translate a single post, not a whole feed. 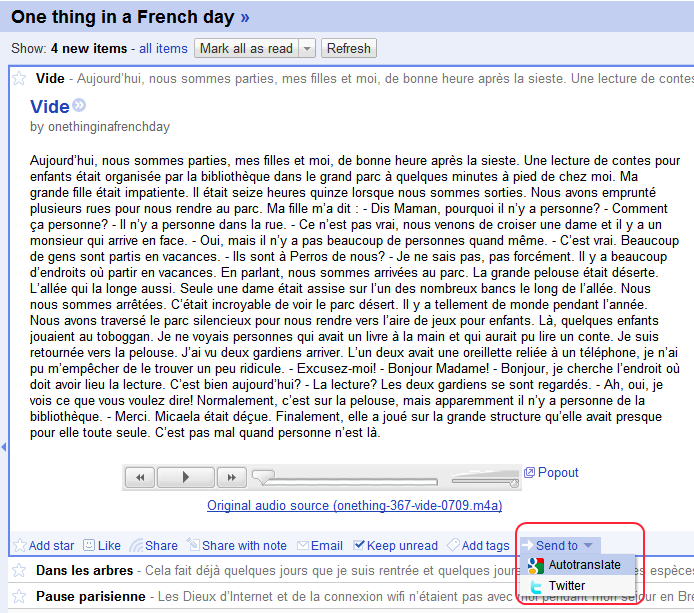 The “Translate into my language” option in Google Reader is an ALL or NOTHING feature. Sometimes I just need to translate a single post. Send To Google Bookmarks would be useful. This is just cool. More fine tuning to help people who need specific elements is always good stuff, and helping the increasing mass of non-English speakers (as well as English speakers reading the growing population of non-English web pages) is just good mojo. This is so cool! I am going to try this out for sure! Could it be translated to polish? Cool stuff made by Google reader. going to try this out. Great feature made up by the team. I’m struggling to keep up with anything that’s already in english so I may not have too much need for this feature. Maybe if they adapted this so that when I was reading the financial news or something about the inner workings of the computer then I could translate it from gibberish into something I can understand. 🙂 That’s me kinda saying I’m thick if anyone’s wondering! I hope they gave the streets back after they were done with them. Excellent. This feature comes very handy. As for your question, I would like to have these links added automatically based on my username on that site. So instead of having a list of sites to select from, I would like the service to recognize any other social bookmarking & blogging web services without having to find the right urls. Joking apart, I do use the Google translate tool a lot, but then, I ‘improve’ the translation and, the final step is my other half – she’s French – enough said. Any comment of the Guardian story? I’ve had a lot of luck using translate with foreign food blogs. It opens up a lot of doors when you don’t need to worry about language break down. 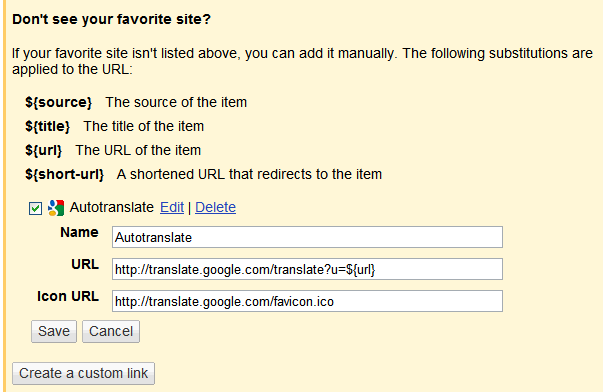 I have also had luck with translation from English back to English in order to get to otherwisef blocked sites. This is a great tip. It is very useful if you are, like me, trying to learn a second language. I do NOT want to have the content auto-translated via the feed seetings option of “Translate in to my language”. I want to read in Italian first, then translate into English–but only when I am unsure about whether I understood the Italian correctly. You gave me a really elegant way of doing this.